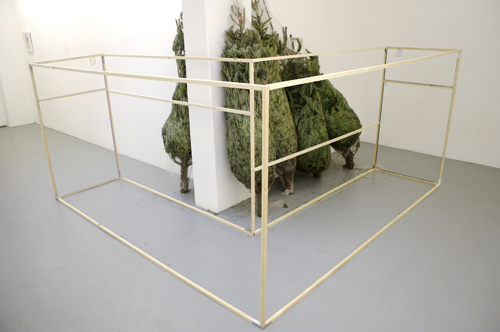 Lucy Clout, Bracket, 2011, floor paint, five trees, brackets, two sets of earrings, dimensions variable. There is a defiant muteness at play in Lucy Clout’s latest show, “Physicalism or Near Enough.” An impish digital portrait of Clout, her hands on either side of her mouth, pulling a toothy grin, stands in as the press release (having been e-mailed in lieu of a conventional one) and is positioned at the entrance of the show. Affixed below the image are swatches of embroidered trim, brocade with shimmery metallic threads, and fake pearls. Even the work’s title, LLLC11_LimoncelloPR, 2011, references what would be the file name for a digital press release. Clout has moreover supplied the gallery with notes about the show, along with strict instructions not to circulate them. If Clout seems to avoid publicity, in her installation she guides viewers to smart vantage points with the skill of a landscape designer. The nondescript interior of the gallery, a former industrial space, becomes like a sequestered, hidden garden. In Bracket, 2011, for example, a copse of pine trees is corralled by a wooden structure constructed from thin lengths of lumber. The work, appearing as it does more than a month after Christmas, suggests that the gallery is out of sync, caught in a time warp. Clout’s show is also inflected with a “gendered” sensibility. For instance, large hoop earrings painted florid colors hang from the two ends of Bracket; the piece sets up an encounter with familiar feminine adornments that pierce a constructed space. In person, Clout has described deliberating in her studio and transferring working processes into the gallery, where she provokes us to look and ponder.